Administrators are encouraging faculty to be more lenient on written notes for absences because of the prevalence of the flu this year. Administrators are warning faculty that attendance may be lower than usual as a severe flu season strikes GW. The Colonial Health Center has so far seen double the number of flu cases this year compared to last year, according to a top official at the health center. Administrators are now encouraging faculty to be more lenient on written notes for absences because of the prevalence of the flu. Experts say college students are particularly vulnerable to the flu because many don’t get flu vaccines and are in frequent contact with large groups of people. Isabel Goldenberg, the medical director of the CHC, said to prevent the spread of the virus, the center is encouraging students with flu-like symptoms to call ahead before seeking treatment. Most sick students need rest, hydration and over-the-counter fever and headache medicines, Goldenberg said. She added that “treatments are not universal,” and that some sick students – especially those with underlying conditions like asthma – may need and can get Tamiflu, a prescription flu medicine, from the CHC. “It’s important to consult with a medical professional if you are concerned you have the flu and to follow the advice that is given,” she said in an email. Goldenberg added that the flu vaccine remains the best way to limit the severity of the infection, though it doesn’t always prevent the illness. Students who aren’t fighting the flu should take measures to prevent it, like washing their hands frequently, using an alcohol-based hand sanitizer and cleaning agents to disinfect doors, toilets, faucets and computer keyboards, she said. In a national flu season that began in October and is expected to end in May, D.C. had already seen more than 624 reported flu cases as of Jan. 13, according to the D.C. Department of Health. Goldenberg declined to say exactly how many cases have been treated at the CHC or if the center has changed staffing to accommodate the influx of flu patients. Flu hospitalization rates this year are the highest in the United States since tracking began in 2005, according to the Center for Disease Control and Prevention. A particularly virulent flu strain has hit almost all states simultaneously and stayed at a high level nationally for weeks. Teresa Murphy, the deputy provost for academic affairs, sent a letter to faculty last month requesting that, given the particularly intense flu season, professors not require student notes from the CHC to get an excused absence from class. 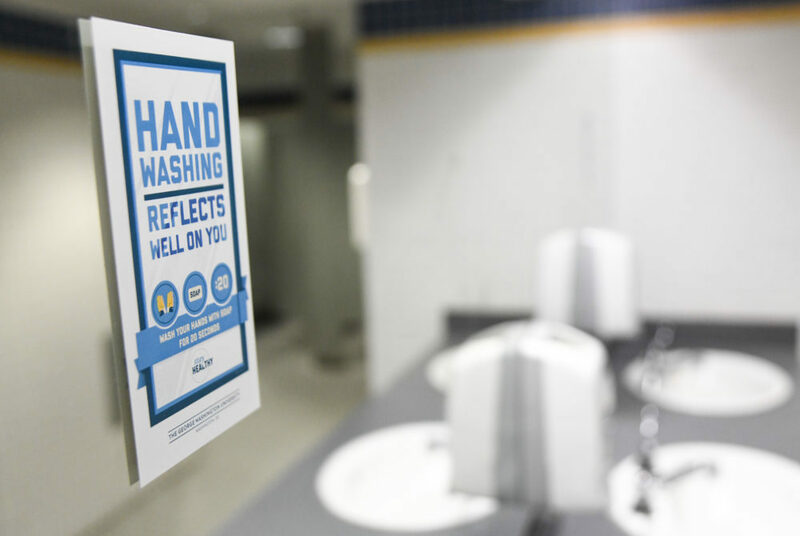 The University is stepping up “cleaning efforts of high-traffic areas” and trying to educate students on how do deal with the flu, including alerting faculty if they need to miss class, she added. George Howe, a professor in clinical and community psychology, said he agreed with the University’s suggestion to not require a written excuse from sick students because students should stay home if they are sick, rather than potentially spread the virus. Howe added that he has seen an uptick in flu-related absences in the early part of the semester. Jeffrey Cohen, a professor of English, said he has noticed an increase in absences in his classes. He said he told his students to stay home if they get the flu and that he and fellow students will help them get back on track with school work later on. Experts said this flu season is one of the worst on record, and that college campuses are particularly risky places to be. Jennifer Miller, an advocate for non-profit organization Families Fighting Flu, said college campuses often experience flu outbreaks because students are “one of the most undervaccinated groups.” She added that students should get vaccinated as a courtesy to those around them, especially young children and elderly family members. Liz Konneker and Lauren Peller contributed reporting.